Ontario’s borders, on almost all sides, are made of water. Boasting over 250,000 lakes, great places to swim can be found throughout the province. There are beaches everywhere, from its urban centre, Toronto, in the south, to more pristine natural areas in the north. The province has shorelines along four of the five Great Lakes (Erie, Ontario, Huron and Superior). At its northern limit, Ontario reaches the Hudson and James Bays. Ontario’s southern coast has many beaches for its numerous city dwellers. Urban beaches are popular with those who are unable to get away for a weekend to travel up north to cottage country. Ontario’s mostly sandy beaches are also easy to find and access. The province hosts the world’s longest freshwater beach. Wasaga Beach stretches 14km along Lake Huron’s coast. This is a popular summer destination with residents and tourists alike. Waters in the southern part of the province are warm, and most beaches are sandy. As you move up north, you can find more rugged beaches that are part of the rocky formations of the Canadian Shield. Tobermory’s turquoise waters, reminiscent of the Caribbean, are ideal for swimming, fishing, and spotting shipwrecks. 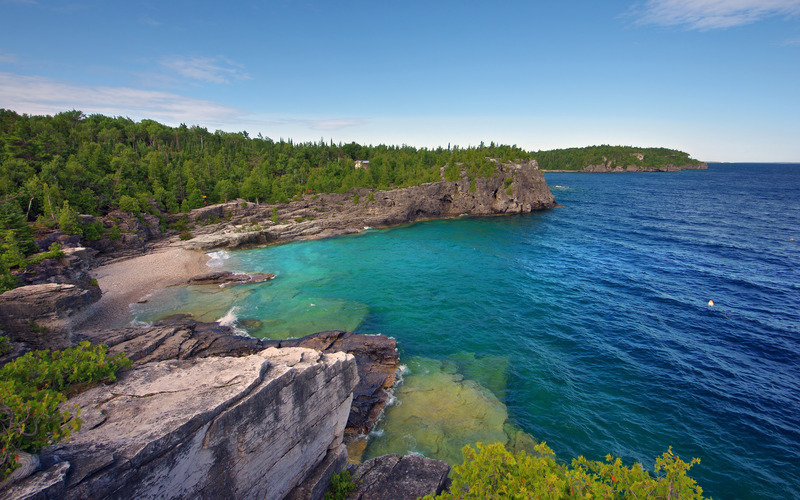 This popular spot is located at the northern tip of the Bruce Peninsula in Lake Huron. Swimming is only one of many activities at Ontario’s beaches. Summer temperatures can reach into the high 20s and 30s throughout the province. As a result, hiking, paddling, sailing and water sports are all popular. Summer days are long in Canada’s southernmost province, so beach goers can plan for full day trips to maximize their time outdoors. Toronto is Ontario’s largest city. The city is home to a string of islands (“Toronto Islands”) off its coast in Lake Ontario. The islands host an airport, residential community, parks and several sandy beaches. These islands can be reached by ferry and are a favourite destination for Ontarians. Ontario’s beaches are a favourite refuelling spot for migratory bird throughout the migratory season as they travel north and south to and from their wintering grounds. For this reason, there are also many protected areas that allow birds and other wildlife to use intact areas of natural land as they move throughout the Province.